In the most absurd episode of the final season, Bobby Bottleservice shrinks himself down so that he can enter his own body and expel the ghost of the love of Farley in a sort of Magic-School-Bus-meets-a-very-strange-video-game reboot of Ghost Bouncers. Yep, it’s about as bonkers as Kroll Show gets, and much like Bobby B. pulls off the scientifically impossible feat of shrinking himself down and entering himself, the episode mostly pulls off the absurd sketch, especially because of those intentionally garbage visual effects inside Bobby’s body. But first, the rich dicks are back, opening a restaurant called Dunch, with Aziz Ansari playing the head charf/chef. The sketch gets a lot of jokes out of the ridiculousness of trendy food spots: “All of our waitresses are biracial” and “the signature piece to our dining experience is the fiberglass table with the teen runaway just living her life.” But my favorite more subtle joke is the overly specific metaphor Ansari’s character uses to describe one of his dishes. There’s something about white water rafting and reconnecting with high school friends in there, and I watch enough cooking shows to know that chefs love a nonsensical, highly specific metaphor as much as they love to talk about acid levels. Ruth Diamond Phillips (Jenny Slate) also returns this week for Laws Of Attraction: When Lawyers Cross The Line, which seems to be a crime-legal docuseries about her unfulfilled affair with a client, Jeffrey Maluso AKA Ref Jeff. Slate plays the lowkey horny lawyer so well, and I love the matter-of-fact cadence she has when talking about just how horny and heartbroken she is. In the court scenes, Slate still thrives, but Park’s And Recreation’s Retta is a bit underused as Ref Jeff’s wife Lara. Then Overheard: Courtroom lets Kroll play around a little more as Ref Jeff, but it isn’t nearly as funny as Overheard: College!, mainly because Jordan Peele isn’t around. But the quick reveal that Ref Jeff and Lara know Steve/Tim is great. At this point, the characters in Kroll Show’s universe are so interconnected that drawing a map of all the character relationships would be about as difficult as navigating a vodka-soaked, fried-macaroni-filled body on a jetski. Which brings us to Body Bouncers, a followup to Ghost Bouncers that no one could have ever seen coming. In it, Bobby confronts his deadbeat dad, as a ghost of Farley (Chelsea Peretti) follows him and his crack team—Peter Paparazzo and Giann—around his body. The renderings of Bobby’s different body parts—his balls, for example, are a dance party at a club—are spot-on, hilarious in their absurdity. It’s not the most clever sketch, but it’s undeniably fun. And someone was definitely having a good time with those special effects. Kroll Show is best when its humor is super specific, and Body Bouncers leans a little too heavily on its weirdness for laughs. It works better than it should, helped in large part by just how committed Kroll is when playing this character. 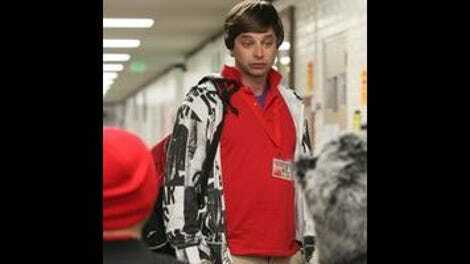 And sometimes ridiculous Kroll Show is just super fun. I could listen to Jenny Slate talk about ghosts for hours. I have a lot of follow-up questions about her Annie Oakley answer. To be fair, I’d also probably freeze-dry my own arms if someone ever called me Rachael Ray. “Bobby, I’m straight up haunting you again.” I love you, Farley. Doesn’t it feel like all the Farley/Bobby stuff this season is potentially leading up to a wedding? How many characters from how many sketches might we expect to see at said wedding? I wish the episode had given us a little more Rich Dicks and a little less Laws Of Attraction. As much as I like Ruth Diamond Phillips, I think Ref Jeff worked a lot better as more of a visual gag on the basketball court and paired with Peele.